The field of 20 Legends for the 2nd annual Patty Sheehan & Friends Pro-Am, an official LPGA Legends Tour event, includes four LPGA Hall of Famers – Amy Alcott, Pat Bradley, Hollis Stacy and Patty Sheehan. The tournament scheduled for June 1, 2012 returns to Hidden Valley Country Club, Reno, Nev., with proceeds benefiting the Patty Sheehan Foundation, supporting local women’s and children’s charities. The cost for a Pro-Am foursome is $4,000. Additional player commitments include: Cindy Figg Currier; Alicia Dibos; Heather Drew; Allison Finney; Cathy Johnston Forbes; Dawn Coe Jones; Cindy Miller; Lotta Neumann; Anne Marie Palli; Laurie Rinker; Kathy Robyn; Jan Stephenson; Kris Tschetter, and Sherri Turner. Three remaining LPGA player spots remain. 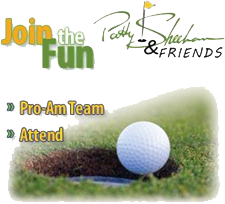 To purchase a Pro-Am team or for general tournament information visit www.pattysheehanandfriends.org. Harrah’s Reno serves as the host hotel and pairings party for the event. Patty Sheehan & Friends is an official Legends Tour of the LPGA event made possible by the Patty Sheehan Foundation. In 2011, the inaugural Patty Sheehan & Friends event boasted a field of 40 LPGA Legends. Christa Johnson captured the win with a 139 total shot over the two-day tournament and walked away with the $35,000 prize purse. Tournament charities including First Tee of Northern Nevada, Step 2 and CAAW each received a check for $5,000. In 2012, the Patty Sheehan Foundation will be the beneficiary supporting women and children charities in northern Nevada.